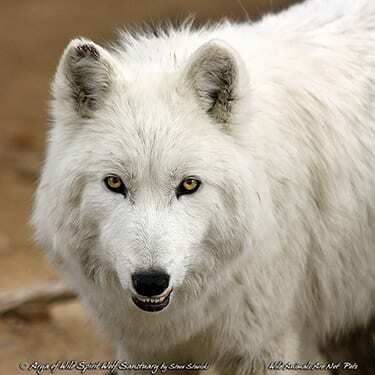 BIO ~ Chiracowa is a neutered male high-content wolf-dog. DNA test revealed that he is mostly wolf, but has a bit of dog in his history. We rescued him in April of 2018 when he was 9 years old. PERSONALITY ~ Chiracowa is a social boy which means he is always paying attention to what is going on around him and also likes to play with his neighboring rescues along the fenceline. He is also comfortable being touched by people he trusts. He comes bounding over when caretakers come into his habitat, but he can get a little too excited. Caretakers have to be on guard for kisses with too much teeth. 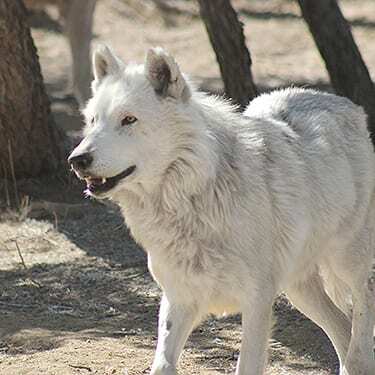 RELATIONSHIP ~ Chiracowa lives with one of our Westeros Pack members, Arya. LIKES ~ Chiracowa loves attention, giving kisses and playing in the water. DISlIKES ~ Chiracowa dislikes when it’s time for his caretaker to leave his habitat and tries to keep her from leaving. FUN FACTS ~ Chiracowa routinely dunks his whole head underwater to go fishing for goodies (that may or may not exist) in his water bucket. WISH LIST ~ Chiracowa would love to find more sponsors to call his extended family. We think our sponsorship package makes a thoughtful gift. It comes with a photo magnet of Chiracowa, a photo certificate and the special offer of our membership t-shirt (or substitute if sold-out) for only $10. Chiracowa is Still Looking for Sponsors! CHIRACOWA’S HISTORY ~ Chiracowa’s story is a very controversial one with many different versions, depending on who is telling the story. The one thing we know for certain is that Chiracowa was bred in captivity to make money for his owner. He was born at a working animal fur farm/petting zoo, where the owner charged visitors different fees to interact with a large variety of wild animals. A DNA test revealed that her wolves were high-content wolf-dogs, which means they tested mostly wolf but had a bit of dog in their history. Some of the people who visited the farm gave it good reviews citing kind staff and well-cared for animals, while others gave it completely opposite reviews, citing small cages and horrible conditions. The owner faced controversy and court battles for many years. She was shut down at one time but re-opened in 2016. We were very excited to offer four of our single rescues the chance of making a new friend. We spend every day and many hours with our rescues and know their different personalities very well. That makes it easier to decide who to introduce to each other, but love is complicated, and rescues don’t always get along. We hoped that Chiracowa would be a good match for our single Westeros Pack girl, Arya. They spent a week getting to know each other in adjoining habitats before Chiracowa joined Arya. We were thrilled to see that she was very happy, and we hope Chiracowa will come to appreciate his new friend.